At a special meeting, the journalist community, political parties and civil society members unanimously endorsed Saturday demand for setting up office of special prosecutor to tackle issue of impunity of crimes against media in Pakistan. “We all are for it,” the participants at the meeting en block said when Nasir Hussain, president of Peshawar Press Club, read out the resolution in Urdu language seeking consent to approve the resolution. The meeting, jointly organized by the Peshawar Press Club, journalists’ representative body Khyber Union of Journalists and Freedom Network, Pakistan’s first media watchdog organization, marked the International Day to End Impunity underlying the need for special steps to tackle the issue of attacks on media. “We demand of the government to create the office of special prosecutor to take up murder cases journalists and investigate threats, harassment and kidnapping cases of journalists,” the resolution read. Provincial Legislative Assembly members Sardar Hussain Babak of Awami National Party and Sultan Muhammad Khan of Qaumi Watan Party assured the meeting all-out support to initiate legislation to create the office of special public prosecutor. Jamiat Ulema-e-Islam (F) information secretary Jalil Jan also pledged on behalf of his party to support the demand inside the Parliament. Relatives of journalist Ayub Khattak, who was shot dead in Karak district on October 11, attended the meeting on special invitation of the organizers giving update on progress the police had made so far. “The killers of Ayub Khattak are identified and nominated. However, Karak police is appearing reluctant to step up the efforts to arrest the accused,” they told the meeting. Pakistan is one of the most dangerous countries for journalists and the United Nations designated it as pilot country along with four others – Nepal, Iraq, South Sudan and Mexico – to experiment the UN Plan of Action on the safety of journalists and the issue of impunity. Around 100 journalists were killed in Pakistan in the last one decade and no single case of journalist murder was investigated nor did bring the perpetrators of the crimes to justice with result that self-censorship among the media-persons increased to a dangerous level to stay safe. KhUJ president Nisar Mehmood told the meeting that the impunity issue was affecting independent journalism and no journalist feeling safe if he or she ever did investigative report. “When attacks on media increasing and no conviction is taking place it is leaves deep impact on working journalists,” he went on to add. All the opposition parties in Khyber Pakhtunkhwa Assembly would move joint resolution calling upon the government to initiate legislation to set up the office of special public prosecutor for media on urgent basis, Sardar Babk, Sultan Muhammad and Jalil Jan pledged during he meeting. 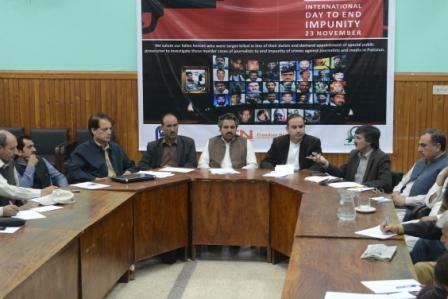 Iqbal Khattak, executive director of Freedom Network, highlighted the issue of impunity and explained how the UN Plan of Action would help journalists stay safe if all stakeholders joined hands to tackle the impunity issue and that what steps had been taken so far to get all stakeholders onboard. “With all the stakeholders united we can overcome this challenge,” he told the meeting. Ibrahim Shinwari, former president of Tribal Union of Journalists, told the meeting that the situation in tribal areas warranted urgent intervention to guarantee security of journalists. He said Taliban and al-Qaeda-linked militancy had immensely affected independent journalism. However, he blamed the current administrative set-up the second biggest impediment to freedom of press of freedom of expression demanding that the special public prosecutor’s jurisdiction needs to be extended to tribal areas.